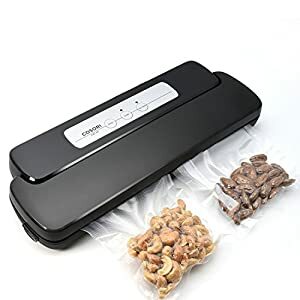 Tags: culinary, Food Preservation, food saver, food sealer, food sealing, food sealing machine, Razorri E5200-M, sealing machine, sous vide, sous vide amazon, sous vide cooking, sous vide machine, vacuum sealer, Vacuum Sealing, Vacuum Sealing machine, Vacuum Sealing System. 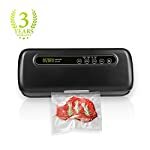 Razorri is a professional manufacturer of Sous Vide kitchen appliances and provides the best food vacuum sealers for all your to Sous Vide needs. Why choose the Razorri E5200-M? The sleek and ergonomic black body is comfortable to hold, makes it a beautiful addition to your kitchen. 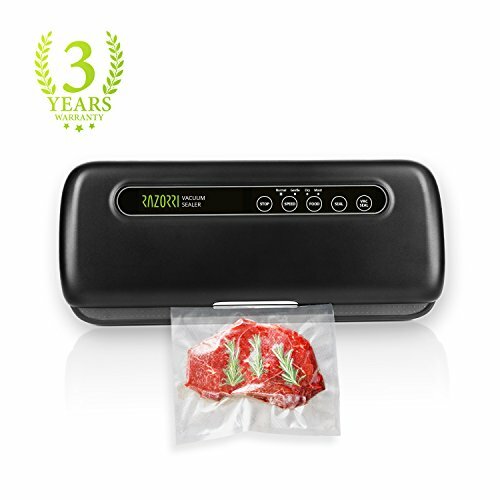 With up to -0.8 bar vacuum power ensures the seal is tight and strong, preserving the food longer and making it easy to keep food fresh. “Normal/Gentle” and “Dry/Moist” mode will meet all your food vacuum sealing needs. 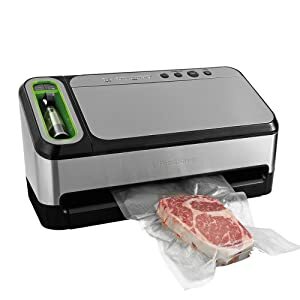 After air suction, preserve the sealed food in the fridge, or cook it for Sous Vide. Now it’s easy to enjoy the best taste, eat healthy, and fresh! Purchasing a Razorri comes with a 3 year long warranty with prompt and helpful service for any problem. 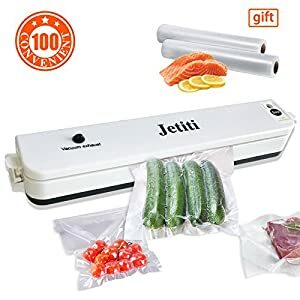 Liquid food and food with a lot of water and/or juice in it is not fit for a vacuum sealer, so we recommend that you first use a dry cloth to remove the liquid. Intervals of 40 seconds is recommended for each operation. 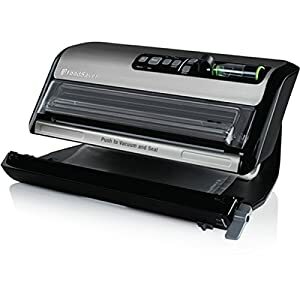 FULL FUNCTION & BEAUTIFULLY COMPACT – E5200-M combines both style and functionality into one product. 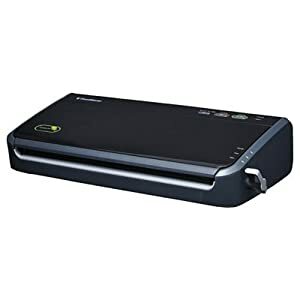 Designed in an all-black color, this sealer is compact enough for any kitchen. BUY IN BULK, SAVE MONEY, EAT HEALTHY. 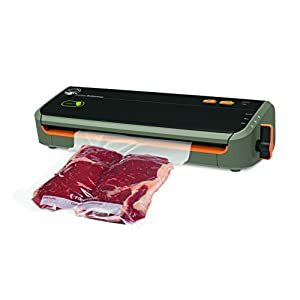 The Razorri vacuum sealer provides STRONG and PERMANENT seal, keeping the food fresh for longer, giving you the ability to buy meats, fruits and vegetables in bulk, instead of buying fresh food in small, expensive amounts on a daily or weekly basis. 2 VACUUM MODES + 2 SEAL MODES – “Gentle” mode is a shorter vacuum process, which is used when you want to keep food in its original shape. This is the perfect mode for food like bread, chips, home-made pastries, etc. You can also stop the vacuum at anytime by pressing “Stop” to control the process. 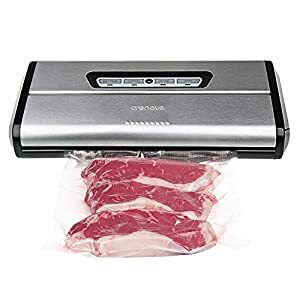 Our vacuum sealer was designed to work with dry AND moist foods. If the food you’re sealing is damp just choose “Moist” mode, otherwise “Dry” mode will get the job done! 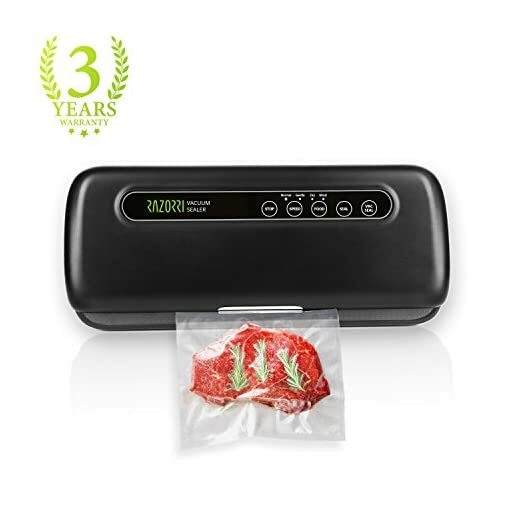 5 TIMES LONGER STORAGE, KEEPS FOOD FRESH – E5200-M keeps food fresh up to 5x longer than ordinary storage methods such as ziplock bags, foil, plastic wrap and tupperware. 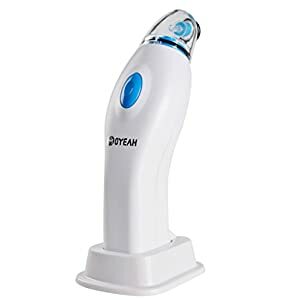 The strong gear motor, piston pump and the completely locked seal space are powerful enough to create a suction up to -0.8 bar so that you can easily eliminate air, seal the food and keep food fresh for longer, giving you up to 5-8x more storage time. ENJOY THE PERFECT TASTE – Ideal for vegetables/meat/fish/fruits/corns/chips, even marinated and salted food could be sealed to preserve longer. Furthermore, the sealed food after vacuum is perfectly ready for sous vide cooking and barbecue. 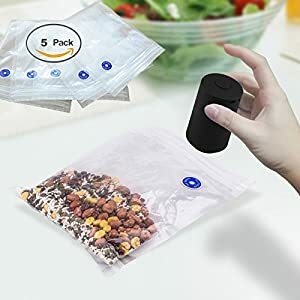 The tight vacuum seal prevents freezer burns on frozen meat and vegetables, and keeps ingredients entirely free from nasty bugs and bacteria. The seal also locks the nutrients in the food, and ensures the aroma doesn’t get lost, giving you the best taste!